This letter is about that new fence you've been wanting and thinking about. I'm sure you've probably seen many fences and even been considering what type of fencing would be best for your home. 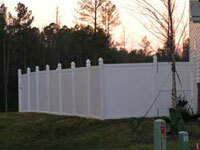 building experts, who specialize in installing fences and truly enjoy fencing with a passion. We pride ourselves on providing our fence customers with professional fence installers, quality craftsmanship, and affordable durability for each fence we build. While some companies offer fencing as part of their home improvement list, our fence devision specializes in building fences. Here's a question for you... Would you want your car worked on by a part-time mechanic? or How about trusting your life to a part-time doctor? Well the same thing goes for your new fence. You work hard for your money and you deserve a real fence, built by real fencing experts! As home owners ourselves, when it comes to fencing, its not just about another customer and installing a fence. 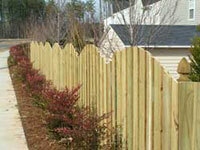 We take time to take into considertaion all your fencing needs as well as your fence project details. We work with you as your fencing partner, because we truly understand that we're building more than a fence. We' re building a landscaped extention of your property and beautiful home. It was a real pleasure to work with you on our home. I really wanted to dress up the property to give it more curb appeal & my goals became a reality. You truly listened & understood exactly what I wanted. You were not the lowest bidder...and I'm glad that you weren't! 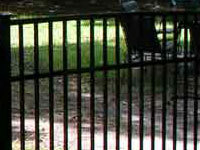 Our fence team has a combined total of over 30 years of fencing experience. We build with the finest fence materials available. Wood Fence, Vinyl Fencing, Chain-Link Fences, Aluminum Fence, Privacy Fencing, Wrought Iron Fences, Black Aluminum Fence, Split Rail Fences, Swimming Pool Fence, Backyard, Yard and Playground Fencing, Picket Fences, Board on Board Privacy Fence and more. Rabbit Fencing, Safety and Insurance Fencing, Private Fence, Semi-Private Fences, Farm Fence, Horse Fences, Vinyl Coated Chain Link Fences, Fence Panels, Lattice Fencing, Ribbed Vinyl Fences, Fencing Accents, Scalloped or Concave Fences, Half-Moon, Arched Fences and more. And we provide a 100% Satifaction Guarantee on the Expert Craftsmanship for your new fence! We're proud to offer a 100% Satisfaction Guarantee on our quality fencing craftsmanship and will go the extra mile for our customers ensuring that you'll be happy and satisfied with you new fence, its our Guarantee! To get started on your fencing project, for your free fence estimate, or if you have any questions about fences (click here) or use the button below. 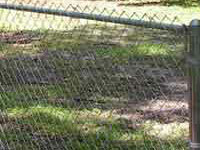 Thanks For Visitng FenceRaleigh.com, a Triangle Fence Site. We look forward to becoming your fencing partner. the beautiful fence work you guys did.